Junket Nepal offers Heli or charter service for sightseeing over the Himalayan range of Nepal to those adventure lovers who have limited time or unwilling to trek. Heli service or tour in Nepal has become widely popular activities as it gives close encounter to the huge range of the Himalayas in Nepal. The common Helicopter tours in Nepal are Everest View Heli tour, Annapurna experience Heli tour, Langtang Valley Heli tour and so many. The Heli tour in Nepal is three-four hours fly over the Himalayan range and is available anytime for any destination in Nepal. So, if you want to experience the world’s highest peak to rural western parts of Nepal in short period of time, we can arrange it anytime you like. 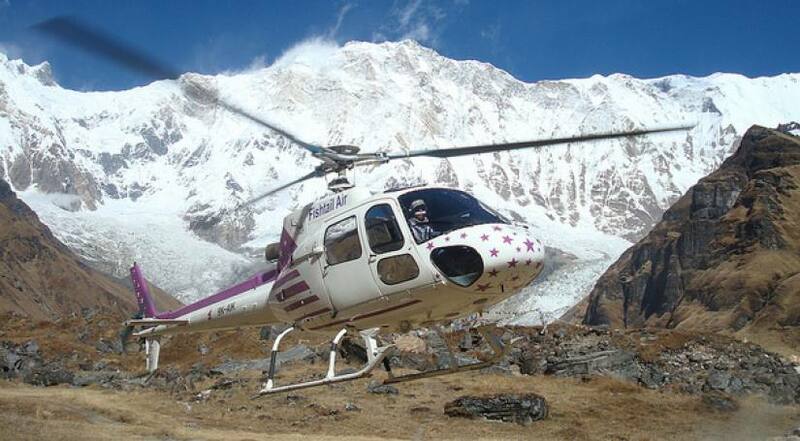 At present, there are two types of choppers giving private Heli service in Nepal. They are AS 350 B3e series and MI-17. The first one is manufactured by Euro-copter, France which is also very popular all over the world. It is one of the most versatile helicopters and is best suited for the fly over mountains. The second helicopter is the powerful Russian made and also term as a big bird, capable of transporting the large group of passengers (22 pax) or four tons of cargo. They offer excellent utility and reliability under extreme conditions and generally used for large groups and huge cargos.